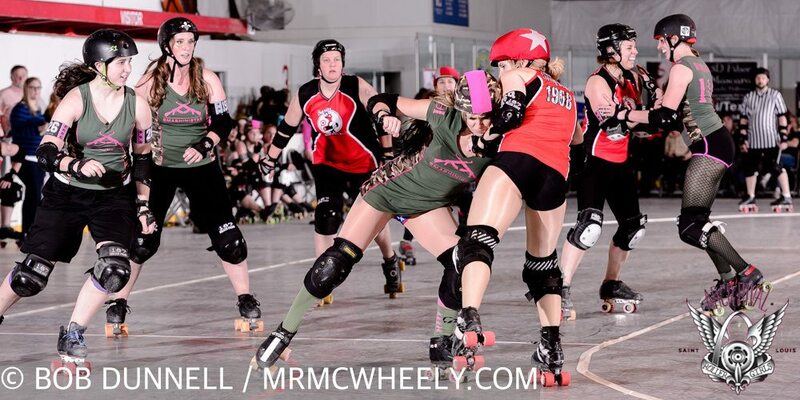 (BALLWIN, MO) In front of 650 fans Saturday night at Midwest Sport Hockey, the victors at the twin-bill for GateKeepers Roller Derby (GKRD) and the Arch Rival Roller Girls (ARRG) were not decided until each game’s waning minutes. In the end, the defending champion for the two flat-track franchises vaulted to first place in their respective league’s standings. In the men’s opener, two-time defending champion, the South Grand Slammers outmuscled the Dogtown Rockets, 152-129, to keep its Turf Wars’ campaign spotless (3-0). 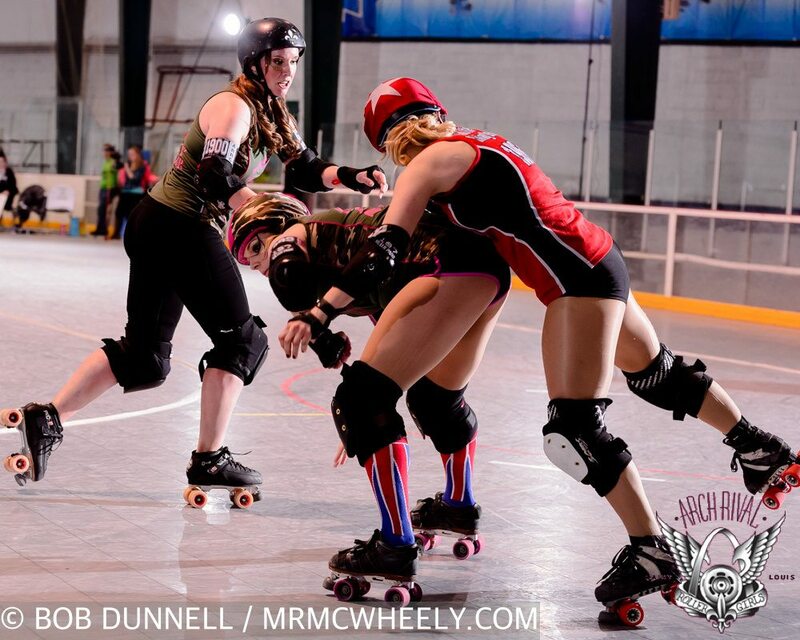 In the women’s nightcap, the Smashinistas topped the M-80s, 166-151, to break the league’s three-way tie in the standings and improve to 2-1. The fifth event of each league’s six-game regular season series continues at Queeny Park on March 7. When the two squads faced each other three months ago, the Slammers doubled-up the Rockets on the scoreboard, 183-95. This time, however, the defending champs were only up by a baker’s dozen with 2:00 left in the game and had to fire on all cylinders deep to remain undefeated and take a powerful stride towards the league’s championship finale at Chaifetz Arena in June. 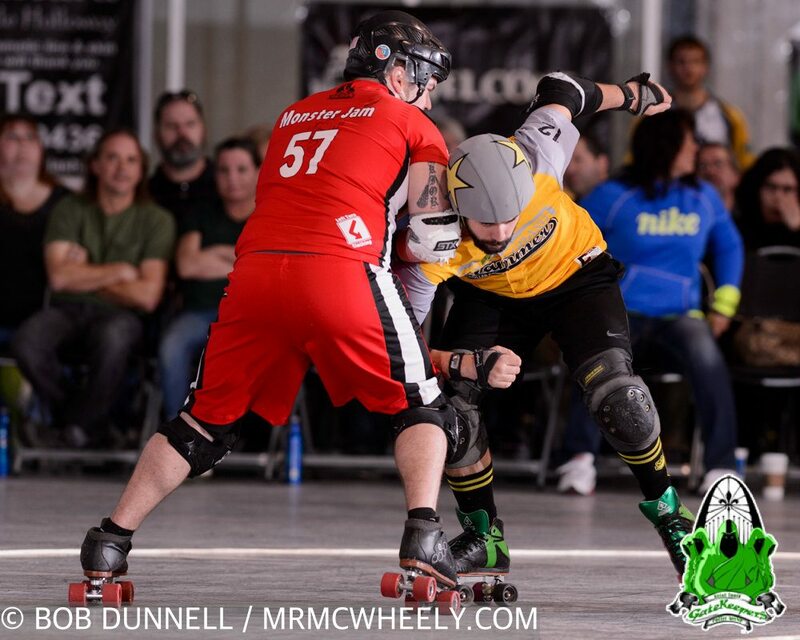 That methodology was shown early as the Slammers possessed an 18-0 lead eight minutes in with the dual scoring threat of jammers Handrail and D Mouthful. The Rockets, propelled by jammers Magnum P.I.M.P. and Shane Bower, countered with 15 points uncontested and narrowed the gap to 18-15 with 16:50 left in the period. The Slammers regrouped and surged with a 22-4 run, capped by Mouthful’s five-pointer scored with 11:45 left in the frame, to widen the margin to 40-19. A Rockets’ 17-0 streak over the next five minutes whittled the score to a four-point affair, 40-36, with 6:50 left. 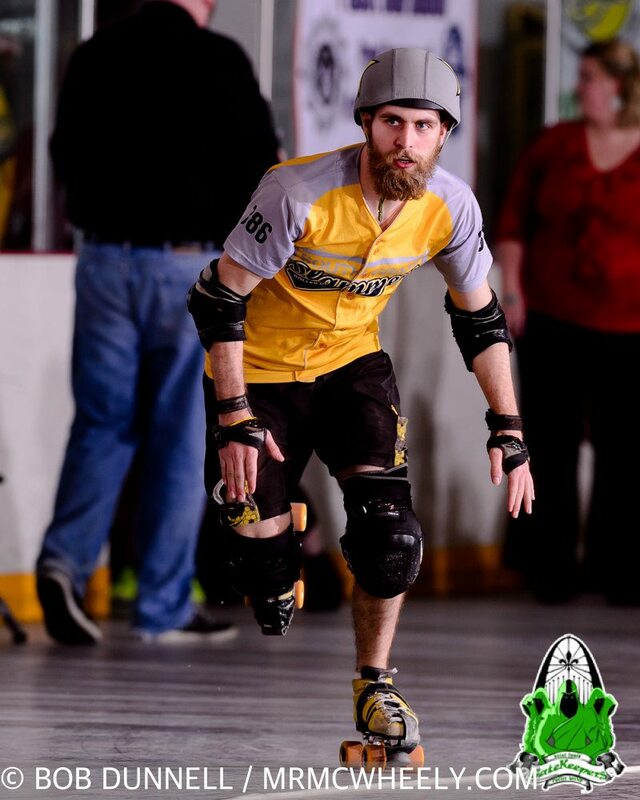 Then, on the next rotation, Magnum, boosted by Slammer penalties, posted a 20-6 strike that flipped the scoreboard to Dogtown’s favor, 56-46. The Rockets maintained a 57-48 lead at intermission, but South Grand’s finest were poised to display that top-notch, physical work ethic to the extreme in the second half’s opening stages. Paced by the powerful walls set up by the aforementioned Diesel, Double Excel, Neil Death Experience, Inquadable Hulk, Fruit Wallup, Gnat King Kill, Dago Whomp, Red Rider and Sweet Tooth, the Slammers posted a 16-6 surge five minutes deep and flipped the scoreboard back to its favor, 64-63, with 24:50 left in the contest. The momentum continued, and then some, as South Grand barreled a 43-5 stretch over the next twelve minutes, punctuated by Handrail’s 19-point strike with 12:25 left that pushed the score to 107-68. Undaunted, the Rockets methodically cultivated its own run over the next eight minutes and inevitably made the differential tight. Led by the charge of blockers Wrecking Bill, Kurt Mangle, Atom Bomb, Dr. Dredd, Specs Offender, Monster Jam and James Mueller, Dogtown posted a 46-29 stretch and whittled the Slammers’ lead to 138-116 with 4:20 remaining. Magnum then scored nine on the next rotation to narrow the score to 138-125 with 2:00 left. Down the stretch, a 14-4 Slammers’ run sealed the 152-129 win, which preserved the spotless record. 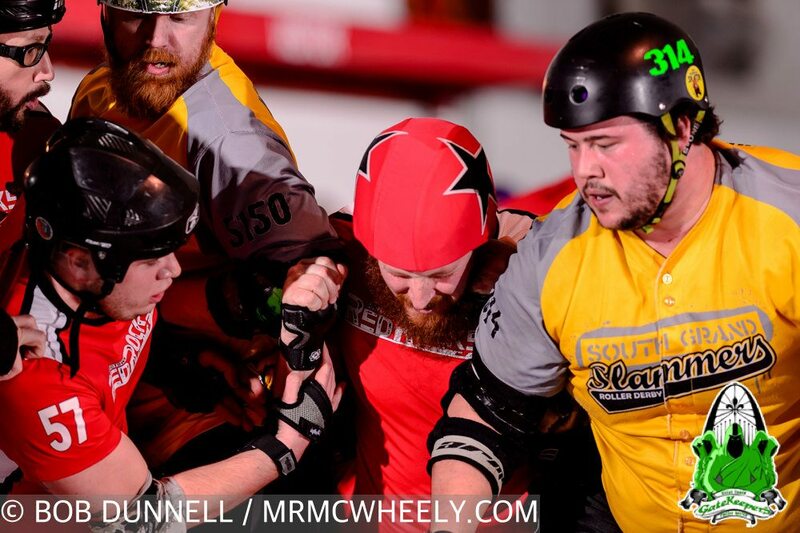 Handrail topped the Slammers’ ledger with 68 points, followed by Mouthful’s 51. The defending champs face the Riverfront Crimes (0-2) on March 7 at Midwest Sport Hockey and look to finish the regular season undefeated. 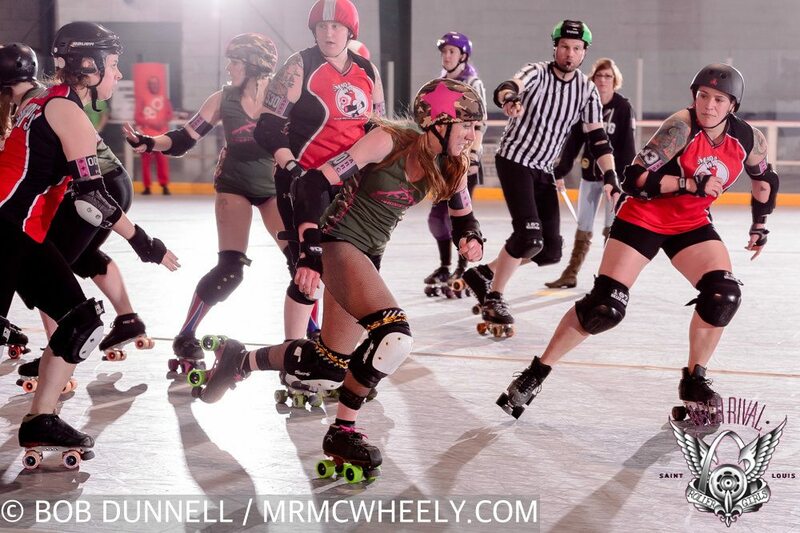 Magnum paced the Rockets (1-2) with 87 points, followed by Bower’s 32. Dogtown is idle until April 4, yet took Saturday’s setback as a momentum boost, considering the wide differential the two teams had in their prior meeting: 88 points in November compared to Saturday’s 23. DOGTOWN ROCKETS (129): Magnum P.I.M.P. 87, Shane Bower 32, James Mueller 10. 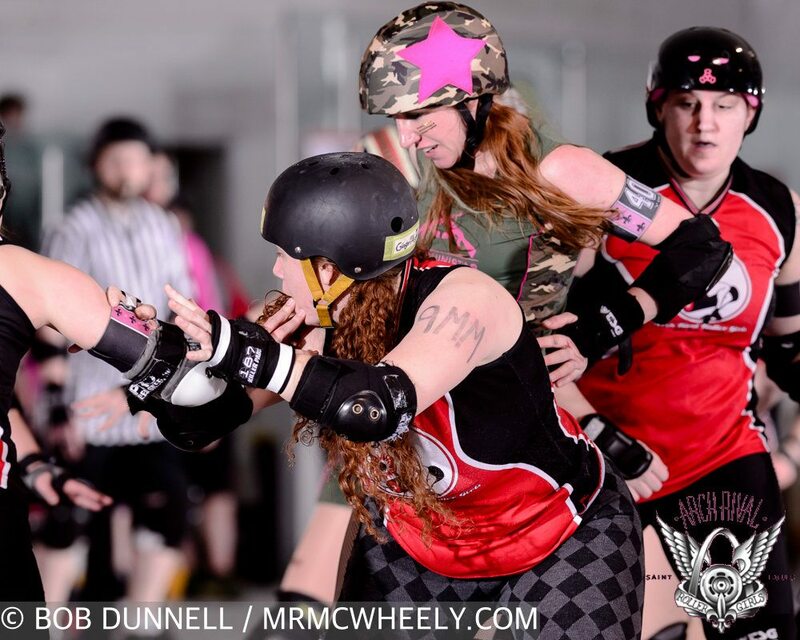 In a topsy-turvy battle that saw the score tied with 8:00 left, ARRG’s reigning queen pins churned a 27-0 rally deep, culminating in a 15-point duke over the M-80s, and grabbed sole possession of first place in the standings with a 2-1 record. Tied 11-11 after four rotations, M-80s’ jammer IDA the Living Dead posted a 12-pointer at 24:00 to give the red-clad rollers a 24-11 lead. Scoring remained tight as the period progressed and the M-80s maintained a 27-21 edge with 18:05 left in the period. The Smashinistas notched its first lead of the contest on the next rotation with Shimmy Hoffa’s 14-point jam that flipped the scoreboard to its favor, 35-27. The lead was extended to 45-31 with 13:30 left following EnYa Nightmare’s 10-point strike. The M-80s regrouped and a 24-9 rally exploded over the next ten minutes, resulting in the game’s second lead change. Tupac Shank-Her notched a four-pointer in jam 17 and IDA followed with five to narrow the lead to 45-40 with 9:30 remaining in the half. Shank-Her’s 9-8 jam two rotations later whittled the Smashies’ lead to 53-49 and IDA posted a 2-1 jam at 5:00 that made the game a three-point affair, 54-51. Shank-Her recorded a four-point strike to flip the scoreboard, 55-54, with 3:24 left in the period. With assistance from blockers Rhino-Might, Party Foul, the Ginger Assassin, Jamheiser Bush, Warpath O’ Jen, Arcane Sugar, Science Friction, Sp!ce Rack, eZe, Betty Blaster and Double J, the M-80s proceeded with an 11-4 period-ending run to post a 66-58 lead at intermission. Comfy lead? Not even! 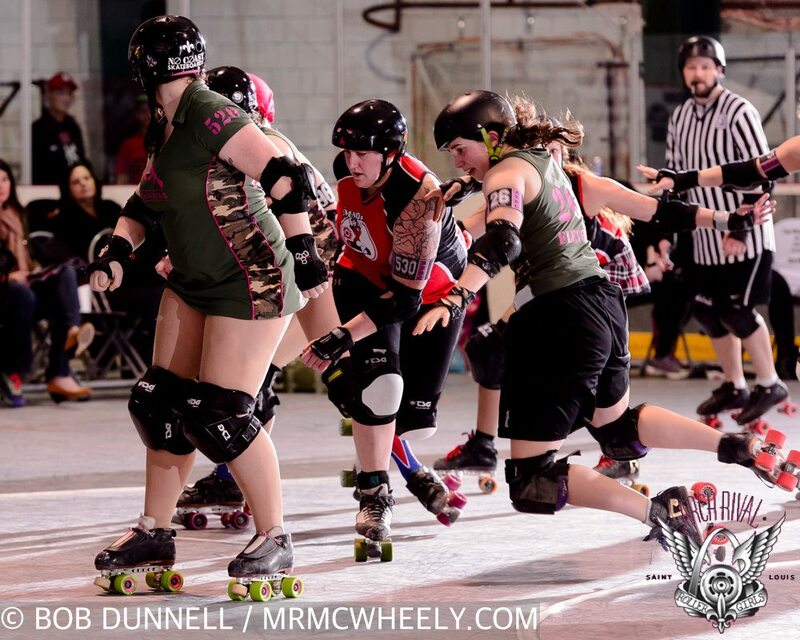 Following a scoreless jam to start the second period, the Smashies regained the advantage as reigning ARRG MVP Brickyard notched a 24-point even-strength strike, resulting in an 82-66 lead change at 27:40. However, the advantage only lasted ten minutes as the M-80s notched another rally. Down 101-87 with 22:00 left, the red rollers notched 14 straight points and tied the score. Five points from Science Friction in jam five was followed by Shank-Her’s nine that made the game a 101-101 stalemate with 19:00 left. IDA’s grand slam on the next rotation broke the tie and gave the M-80s a 106-101 edge. 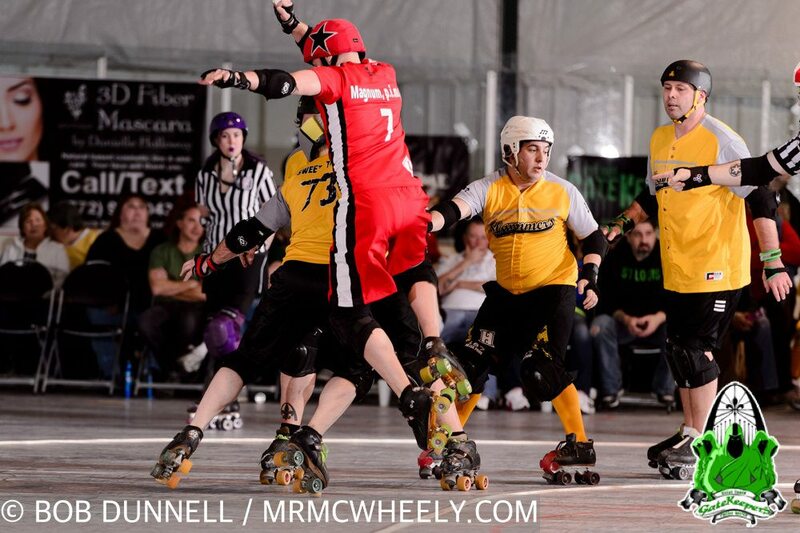 The lead swelled to 130-116 following the jammer’s 24-point strike with 10:10 left. Against the wall, the Smashinistas’ blocking battalion, paced by Fawkes, Eli Wallop, Downtown Dallis, Shimmy Hoffa, Party RockHer, Chewblocka, Prof. Rumbledore, Fletch-A-Sketch, Rock Slobster, Holliver Fist and Hakuna Renata, put the M-80s on lock down, holding them scoreless for the next eight minutes. Meanwhile, the Smashies went on its own scoring stretch. Brickyard posted four with 9:30 left to whittle the deficit to 130-120. Drag-Her’s 10 point power jam with 8:00 left resulted in the game’s third tie, 130-130, and all seemed ripe for a photo finish. However, the Smashies continued the scoring streak, a 27-0 run, that pushed the score to 143-130 with 4:10 remaining. Brickyard’s 14-8 power jam with 2:10 left stretched the lead to 157-138 and sealed victory. The Smashies outscored the M-80s, 108-85, in the second period en route to the 166-151 win, the team’s second this season, and break the three-way tie in the ARRG standings. 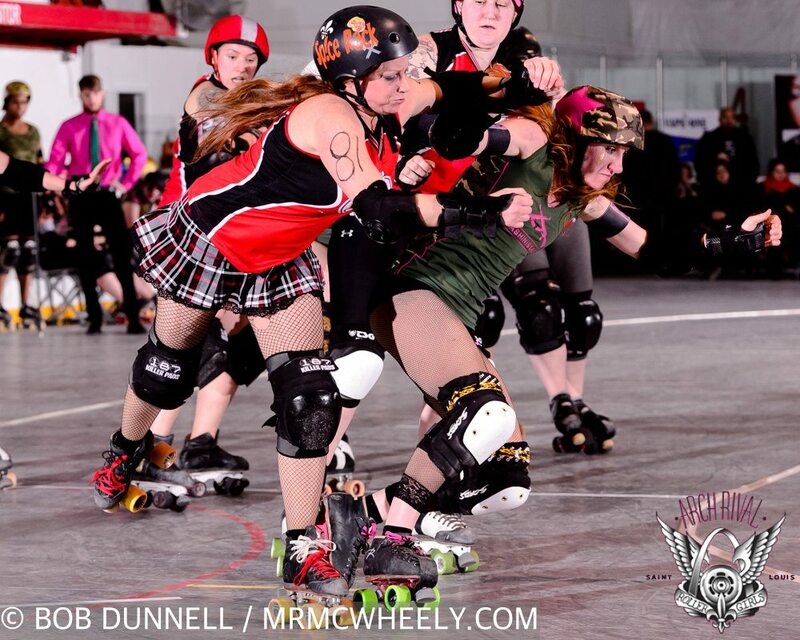 Brickyard paced Smashinistas’ scoring with 86 points, followed by Nightmare’s 36. 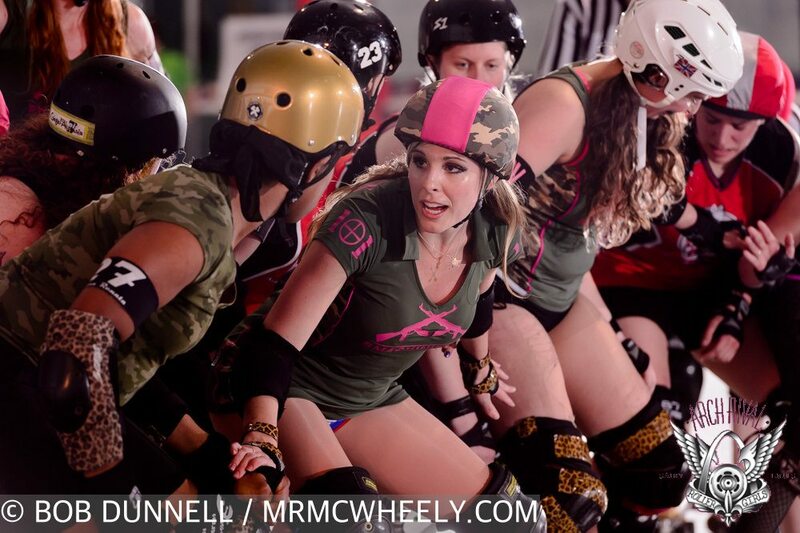 The camo-clad rollers are idle until April, but a future win secures a spot at ARRG’s trophy game, set for June at Chaifetz Arena. IDA topped the M-80s (1-2) with 78 points, followed by Shank-Her’s 62. 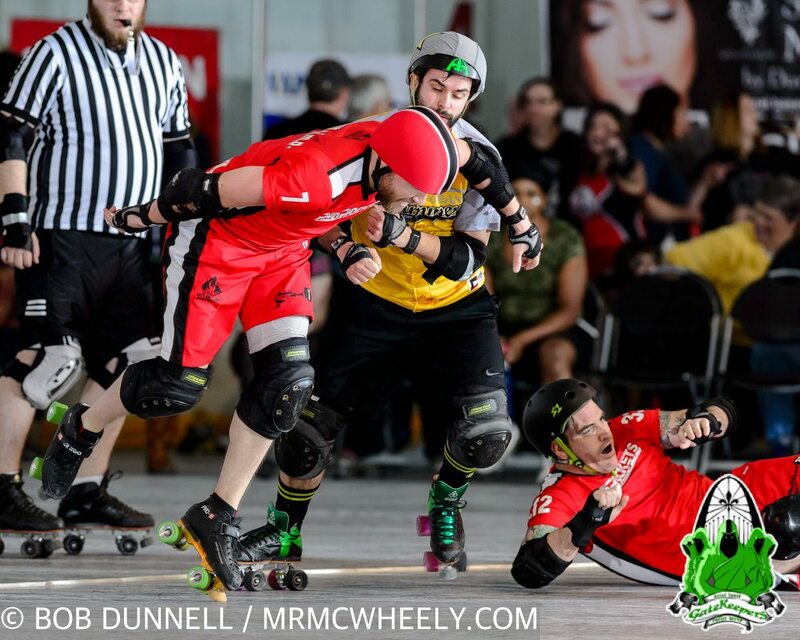 The “firecrackers on quads” face the Stunt Devils (1-1) on March 7 and need a victory in order to keep its dream of making the league’s Chaifetz Arena title tilt a potential reality. SMASHINISTAS (166): Brickyard 86, EnYa Nightmare 36, Cloak N’ DragHer 25, Shimmy Hoffa 19. M-80s (151): IDA the Living Dead 78, Tupac Shank-Her 62, Science Friction 11.